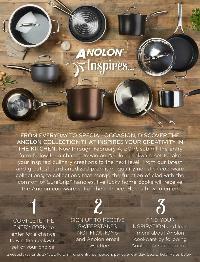 Prize: 5 winners: Anolon Accolade 10-Piece Cookware Set: 1.75-Quart Saucepan, 2.5-Quart Covered Saucepan, 3-Quart Covered Sauté with Helper Handle, 7.5-Quart Covered Stockpot, 8-Inch Skillet, 10-Inch Skillet ($499.99). 7 other winners of various cookware sets. Statistics: This contest was opened by 51 and entered by 12 ContestChest.com members. 24% of those who opened the contest, entered it.